An enemy—or a friend? No way to know except the forbidden touch of an alien mind. Kena is the only human in a multi-racial starship crew. She’s admired for her navigational skills, but her race is viewed as problematic. Cultural differences abound, seasoned by unexpected similarities. Those lacking telepathic abilities have another disadvantage. Kena presents the crew with a paradox. She cannot be a telepath, and yet she is. Their challenging mission strains every limit and claims lives. When an enemy discovers their presence, Kena is captured. As both guest and prisoner, she finds the PitKreelaundun race much harder to comprehend than any she has known. They entwine kindness with cruelty. Worst of all, their telepathic practices are intolerable to a human, threatening Kena’s sanity and life. Mutiny is forming among her captors, rescue is impossible, and diplomacy fails. There is only one way out—something that Kena must never do. 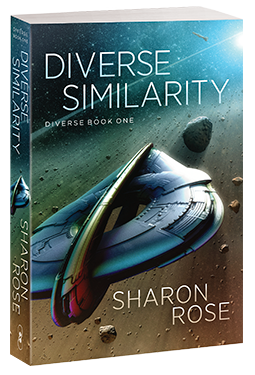 Diverse Similarity is the first novel in a compelling science fiction series by Sharon Rose. If you are intrigued by alien cultures, rich characters, and dangerous adventures among the stars, this book is for you. Read it soon and explore not only outer space, but the spirit within.